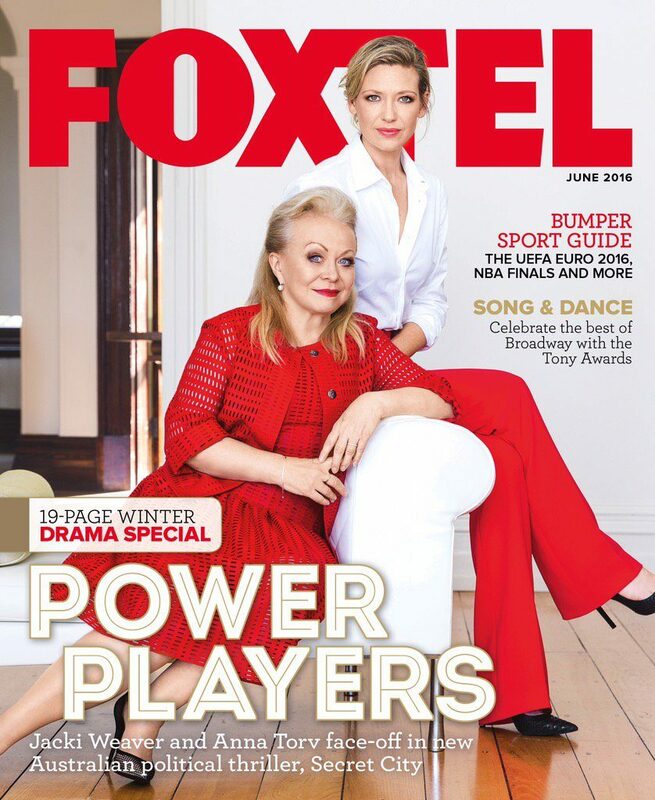 Anna Torv sizzles in the June issue of Foxtel Magazine! Not many television projects have enough pulling power to lure two accomplished actresses from Hollywood back to Australia. But, for Jacki Weaver and Anna Torv the hook of working on new politicial thriller, Secret City, had the pair jumping on a plane and back to their home turf. For Weaver, who has played her share of intelligent women, it’s the more complex characters that appeal most. Secret City’s workaholic senator, Catriona Bailey, immediately sparked her interest. “She is very complicated, which I love because real people are full of contradictions, and she’s very powerful being the attorney-general,” she says. Weaver’s character is joined within Canberra’s inner echelons by Torv as Harriet Dunkley, the political journalist caught up in a web of conspiracies. Secret City is inspired by best-selling novels The Marmalade Files and The Mandarin Code (both HarperCollins), co-written by experienced political journalists Chris Uhlmann and Steve Lewis. It’s an all-too-plausible tale of political scheming, old-fashioned duplicity and new world order — all brought to life by a high-calibre cast. Harriet was originally a man (Harry) in the books. “It’s great that they have changed some of the characters to women,” adds Weaver. Torv describes her character as an idealist. “We meet her after she’s had a bit of a rough trot, but that idealism is still there,” she explains. Her career has suffered at the hands of an influential politician, she’s feeling world-weary, but she’s still working in the Canberra Press Gallery. “Every political journalist I spoke to, without fail, talked about the idea of truth, that through the medium you should be able to change things. There was an idealistic attitude,” says Torv. When we first meet Harriet, she is chasing the scoop of her career. She’s convinced two seemingly unconnected events – a young Australian woman lying blind and burnt in a Beijing prison and the gutted body of a young man fished from Lake Burley Griffin – have more in common than anyone admits. The stakes are high. China is busy asserting its regional muscle while the US is working doggedly to contain it. Australia is trapped in the middle with both countries expecting its support. The stellar cast includes Alan Dale as prime minister, Dan Wyllie as the defence minister, Alex Dimitriades as an ASIO officer and Mekhi Phifer as the American ambassador. Harriet’s unwelcome sleuthing throws her firmly into the orbit of the politicians and intelligence officials who wield the real power, and they are willing and able to do anything to preserve it. Her phone is hacked and her every move tracked. Her house is raided and her computer is wiped. Loyalty gives way to betrayal. There are dangerous enemies to be found in every shadowy corner. “Harriet inhabits several worlds,” says Torv. “She is first and foremost a journalist, but she also moves among the politicians and the dissidents. Being able to film scenes on location in Canberra and at Parliament House added to this semblance of reality. The doors of the Parliament were thrown open to cast and crew. “We had amazing access throughout Parliament House for filming, including to the rarely seen prime minister’s courtyard,” says Weaver. “We were in the PM’s vestibule. We were there in the corridors of power. We were in there just days before the Turnbull/Abbott spill. “So those corridors that I’m running up and down are the real place, with the clocks every few yards because when the bells go you’ve got to be in the chamber to vote,” reveals Weaver. Torv also acknowledges that the unprecedented access to Parliament House was special, particularly seeing the press gallery and getting to meet with the journalists. “I think everyone likes truth-seekers, and that’s exactly what the show’s got,” the actress explains. Phifer, the American actor who plays US Ambassador Morton (he also starred in the long-running medical drama ER), reveals that while the story is fiction, it is laced with truth. “We were working on a scene one day and the storyline we were shooting was exactly the same as one that was in the newspaper that the executive producer had that day. Amazing,” he whistles. He’s convinced that, like him, viewers will be drawn into the murky underbelly of Australian politics because of the smart writing, intriguing subplots and complex characters of the miniseries. “I think audiences do want complicated, intelligent stories that they can engage with,” he says. Dale plays the wily but somewhat oblivious Labor PM, Martin Toohey. “He’s got people around him, such as Jacki’s character, who are studiously keeping him in the dark, pulling the wool over his eyes, which I think probably happens quite a lot to PMs,” he smiles. At a time when hacking and tracking is rampant and trust in economic and political institutions waxes and wanes, this six-part series taps right into the public’s concerns and looks at how Australia’s relations with the US and China might impact on all of us.